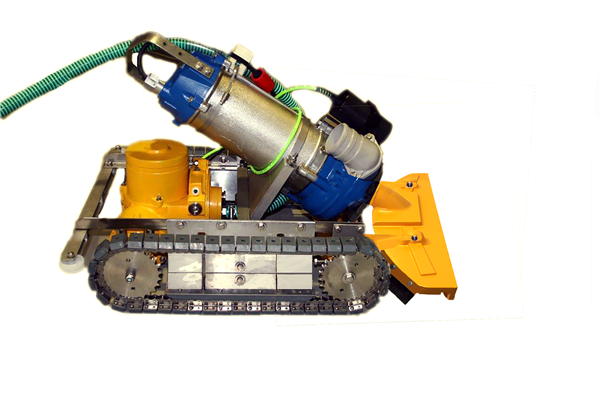 YT-600 is a remote controlled vehicle for sediment (sludge) removal in all sorts of reservoirs'. The powerful on-board submersible pump and wide nozzle allows for efficient cleaning of large bottom surfaces. The sediment is pumped through a hose to a seleceted discharge point or to a filter. Traditional cleaning after draining and then removal of the sediment requires the reservoir to be taken out of operation, which creates disturbances and may result in cracks and other problems in the reservoirs' bottom and wall structure. By using the YT-600 the reservoir may stay in operation during cleaning. The YT-600 is used today in several different industrial applications, from mines and desalination works to cooling towers – in various industries. YT-600 is easily handled by one operator. YT-600 can be equipped with cameras and lamps in order to facilitate operation from a van or a control room. To use YT-600 decreases the cleaning costs and does not disturb the distribution. YT-600 has only electrical engines and uses no dangerous oils or chemicals that may damage the reservoir. YT-600 is delivered in the standard version with a 1.5 kilowatt pump and a 630 mm broad nozzle with a built-in fixed assembled brushes. Alternative pumps and nozzle designs can be delivered when needed.